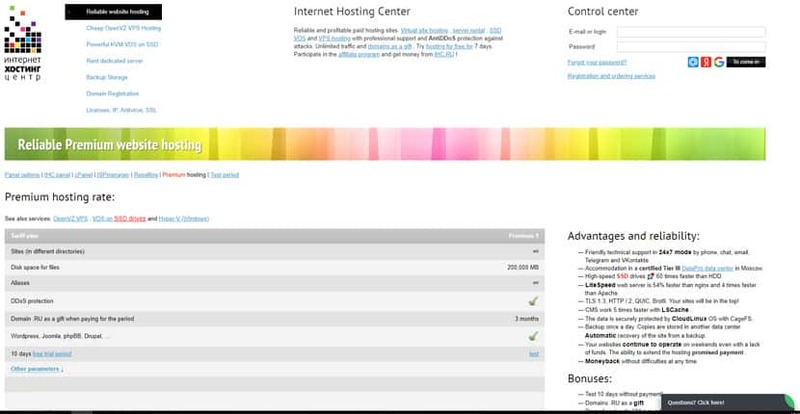 Internet Hosting Center Review 2019: Is Internet Hosting Center a Good Hosting? Founded in 2009, Internet Hosting Center is a Russian web hosting vendor with pocket-friendly SSD shared hosting plans as well as OpenVZ VPS and KVM virtual dedicated servers. They’re one of the largest hosting providers for businesses of all sizes in Russia, ranking in the top ten by market share. Internet Hosting Center is a Russian web hosting company. The vendor was established in 2009 and has a significant presence in Ukraine, Bulgaria, Belarus, and the United States. They’re amongst the top ten largest hosting vendors in Russia by market share. Their website and service is only available in Russian. On top of that, their use of LiteSpeed Web Server and LSCache hosted on a CloudLinux OS with CageFS setup increases the speeds, security, and stability of your web hosting accounts. More code-savvy users will also be happy to know that this host supports multiple versions of PHP from 5.2 to 7.2 in addition to CGI and Perl 5, although they don’t seem to support more advanced scripting languages such as Ruby, Ruby on Rails, or Python. Plus, they perform automatic daily backups for all their plans, which is something you’ll definitely want to have particularly if you’re running an open-source CMS such as WordPress. That said, one major downside of Internet Hosting Center is the timing and duration of their daily automatic backups. They sometimes perform their automatic backups during peak hours, which can slow down your website. Another downside I noticed is that the admin interface doesn’t allow you to assign roles for different levels of access, e.g., administrator, accountant, technical specialist, and so on. Anyone you give access to your account will have the same level of access as you, which may prove a problem for companies with multiple people contributing to the website. Internet Hosting Center has highly affordable and flexible plans, particularly when you consider the number of value-added features they give you. One thing I liked about this host is that even their entry-level shared hosting plan includes unlimited MySQL databases and emails: many of the basic plans from other providers are typically stripped down to the bare minimum in order to keep prices low and entice users to go for more expensive plans. That said, while inexpensive, the basic plan only gives you 1GB storage, though this should be sufficient for a simple and largely-static website. All prices are in Russian rubles. Users who subscribe to an annual plan get two months of hosting free (which essentially means they only pay for ten months of hosting), along with a free one-year domain for first-time customers. On top of that, you get a trial period to test out their service: seven days with their regular shared hosting plans and ten days with their premium shared hosting plan. You can contact the Internet Hosting Center support team via email, phone, and live chat. Like the rest of the website, the live chat is only available in Russian. The hosting provider also has a knowledge base that includes a section where you can download user guides and software. Most Internet Hosting Center customers have had very little interaction with the vendor’s support team, which is a testament to the quality of services they provide. That said, on the rare occasion when you may need the help of their technical team, you may find yourself quickly frustrated: the vendor offers very limited support over the phone. For more comprehensive support, users can only correspond via email, which can be tedious and slow when dealing with emergencies. Plus, their phone support representatives often have a boorish and unhelpful attitude. Internet Hosting Center is an excellent hosting vendor for businesses in Russia. While the company’s support services leave much to be desired, many of their users rarely ever find themselves in need of technical help because the hosting solutions work smoothly most of the time. Wondering how Internet Hosting Center stacks up against other Web Hosting companies? Enter any other Web Hosting company and we will give you a side-by-side comparison.